Here are Mick Waller, Doug Laughton and John Rutherford presenting two cheques of £400 each to Hilary Sadler and Albert Armstrong. Hilary and Albert were representing ‘Coronary Support Group’ and ‘Macmillan Cancer Support’. The concert turned out to be a resounding success enjoyed by audience and entertainers alike, including Aled who, on his Sunday morning program on Radio 2, commented on the warmth he had felt from the audience. The Chemotherapy Unit at the University Hospital of Hartlepool is to be our nominated charity for 2008. Hartlepol Male Voice Choir took to the road to sing its heart out in Germany. The Choir set out for Germany, where it would spend three days with a choir in Huckelhoven. The Choir has a good relationship with their counterparts in Huckelhoven, which was twinned with Hartlepool in 1973. Our adopted charity for 2006 will be the Hartlepool and East Durham Diabetic Group. Hartlepool Male Voice Choir raised £750 for Hartlepool Breast Cancer group, The Pansies. 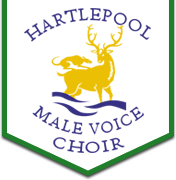 The money was raised during the choir’s Christmas concert, which was held at the Borough Hall, on the Headland, Hartlepool. The choir raised £500 for the Great North Ambulance, and to show their appreciation, the singers were given a special look around the MD902 Explorer helicopter which attends emergencies across the region. Choir members Duncan Graham and Allan Millington were shown around the helicopter at Durham Tees Valley Airport.